This office moving kit has been put together with all the necessary items to help 2 people when packing up and moving out of their office. With a selection of 4 printed moving boxes, 5 archive storage boxes and 6 EconoBox cartons as well as a variety of packaging sundries, you will have everything you need to store your paperwork, stationery, files and appliances and make your office move a simple and efficient one. 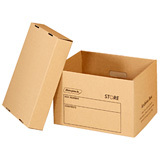 The printed moving boxes are made from strong double wall corrugated cardboard while the archive boxes are made from lightweight single wall cardboard. Both contain carry handles for safe and easy lifting. These products can also be bought separately if you wish to add further packaging supplies to your kit.